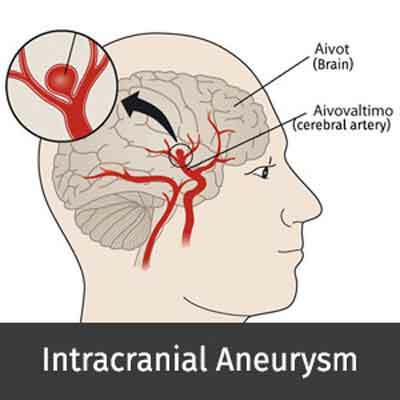 Intracranial aneurysms are focal outpouching from intracranial arteries with weak walls as compared to normal arteries and therefore have propensity to present with intracranial bleed, usually subarachnoid hemorrhage (SAH). Clinically, these cases present with sudden severe headache (‘thunderclap headache’) in case of bleed (1-6). Occasionally, these lesions may grow to significant size without bleeding and manifest clinically because of compression of adjoining brain parenchyma or cranial nerves (2-4). The word aneurysm comes from the Latin word ‘aneurysma’, which means dilatation. Aneurysm is an abnormal focal dilatation in the wall of a blood vessel, usually an artery, due to a defect, disease, or injury (5,6). Aneurysms can be true or false. A false aneurysm is a cavity lined by blood clot. The 3 major types of intracranial aneurysms are saccular, fusiform, and dissecting (1,6). Ministry of Health and Family Welfare, Government of India has issued the Standard Treatment Guidelines for Intracranial Aneurysm. Any patient presenting with or suspected to have non traumatic subarachnoid hemorrhage (SAH) or uncommonly, focal neurological deficit with demonstration of aneurysm on Imaging should be suspected of harboring an aneurysm (3-6). It is underdiagnosed, undertreated, and much more common than previously thought. Incidence of the condition in our country is not exactly known due to lack of organized data. International literature suggests incidence between 1-6% in general population. Clinically, other causes of ‘thunderclap headache’ merit consideration (1-6). These include cerebral venous thrombosis, cervical dissection, migraine, pituitary bleed, reversible cerebral vasoconstriction (Call Flemming syndrome). Radiologically, other causes of subarachnoid hemorrhage need consideration which are trauma, brain arteriovenous malformations (AVMs), bleeding disorders and other rare causes. i. Cigarette smoking – increases the risk of an aneurysm rupture. Smokers are three times more likely to have an SAH than non-smokers. ii. Alcohol & drugs use – It is unclear if alcohol use increases the risk of developing an aneurysm, but moderate to heavy drinking is considered a risk factor for the rupture of an aneurysm if present. Similarly, drug use, particularly cocaine, may increase the risk of rupture. iii. High Blood Pressure – several studies found that having high blood pressure increases the risk for developing an aneurysm and for rupture of existing aneurysms (7). i) Sudden severe headache (‘thunderclap headache’) in the absence of obvious head injury. iii) Demonstration of aneurysm on imaging during evaluation for any neurologic problem. CT scan should be sought on any patient with non-traumatic SAH. Large Aneurysms or their wall calcification may also be at times seen on NCCT. Conventional angiography like images of the cerebral vasculature can be obtained using rapid contrast infusion and thin-section dynamic CT scanning (CTA). Various 3-dimensional display techniques, including shaded surface display, volume rendering, and maximum intensity projection, are used to complement the conventional transaxial images. It has very high diagnostic accuracy with sensitivity and specificity of >95% (8-10). MRA should be usually performed only if there is some contraindication to CTA or CT cannot be easily performed. The sensitivity and specificity is lower as compared to CTA (11). It remains the gold standard for diagnosis, particularly in delineating small aneurysms. DSA is usually always required in case any endovascular or surgical treatment is planned (6,8). (1) To closely follow up in case of incidentally detected asymptomatic aneurysms by clinical and radiological re assessment periodically. (2) In symptomatic group, treatment options include endovascular coiling of the sac or surgical clipping of the aneurysm neck. Subarachnoid hemorrhage: The most common presentation of intracranial aneurysm is subarachnoid hemorrhage (SAH) in non traumatic background. On presentation, patients typically report experiencing the worst headache of their lives (thunderclap headache). The association of meningeal signs should increase suspicion of SAH. Mass effect: The so-called giant aneurysms (diameter >2.5 cm) are more often symptomatic because of their mass effect. Some intracranial aneurysms produce cranial neuropathies. A common example is the third nerve palsy that is secondary to posterior communicating artery aneurysm or III/IV/VI nerve palsy seen in giant cavernous ICA aneurysms. Rarely, even visual loss caused by an ophthalmic artery aneurysm that compresses the optic nerve has been reported. Other symptoms: Other, less common, symptoms include seizures, headaches, and transient ischemic attacks or cerebral infarction secondary to emboli (usually associated with large or giant partially thrombosed aneurysms). Severe vasospasm associated with SAH is often the leading cause of death. i) CT-to confirm SAH or to look for diagnostic possibility of aneurysm as a cause for focal neurologic deficit. ii) CTA/MRA-if available, to confirm the diagnosis before referring to higher center. Based on the available literature, the management of aneurysm differs in ruptured and unruptured patients (1, 5,6, 12,13). Ruptured aneurysms should be treated urgently (within 72 h of hemorrhage) to prevent rebleeding and to permit aggressive Management of vasospasm. Unruptured aneurysms are generally treated electively and may even be followed up if small (<7mm) and incidentally detected. Administer calcium channel blockers (nimodipine for 21 d) to all patients; this has been shown to improve outcome (6,14). Anticonvulsant use is controversial, but is generally given (levetiracetam or phenytoin), particularly for patients undergoing craniotomy or those with focal cerebral hematomas in addition to the SAH. Ventricular drainage: Blood in the subarachnoid space obliterates the arachnoidal villi / ventricular foramina, causing acute hydrocephalus. In life threatening state, a ventriculostomy catheter should be emergently placed (6). Definite Management: Endovascular coiling or Surgical Clipping – To be done at higher center with expertise and infrastructure. A diagnosed or suspected case of aneurysm which warrants urgent or early intervention due to presentation (SAH or neurological deficits) should be referred to tertiary care center with facilities for endovascular treatment or neurosurgery as early as possible. Subarachnoid hemorrhage:The most common presentation of intracranial aneurysm is subarachnoid hemorrhage (SAH) in non traumatic background. On presentation, patients typically report experiencing the worst headache of their lives (thunderclap headache). The association of meningeal signs should increase suspicion of SAH. Other symptoms: Other, less common, symptoms include seizures, headaches, and transient ischemic attacks or cerebral infarction secondary to emboli (usually associated with large or giant partially thrombosed aneurysms). Severe vasospasm associated with SAH is often the leading cause of death. i) CT Scan – to confirm SAH or to look for diagnostic possibility of aneurysm as a cause for focal neurologic deficit Large Aneurysms or their wall calcification may also be at times seen on NCCT. ii) CT Angiogram (CTA) – Angiography like images of the cerebral vasculature can be obtained using rapid contrast infusion and thin-section dynamic CT scanning (CTA). Various 3- dimensional display techniques, including shaded surface display, volume rendering, and maximal intensity projection, are used to complement the conventional transaxial images (8-10). iii) MR Angiogram (MRA)- MRA should be usually performed only if there is some contraindication to CTA or CT cannot be easily performed (6,11). iv) Digital Subtraction Angiogram (DSA)- It remains the gold standard for diagnosis, particularly small aneurysms. DSA is usually always required in case any endovascular or surgical treatment is planned (1,5,6). As outlined above. If not already started, supportive treatment should be started immediately. Obliteration of an aneurysm can be done by either putting metallic (usually titanium) clips at the aneurysm neck (‘clipping’) or by packing the aneurysm sac from inside by using platinum coils (‘coiling’) through endovascular (transarterial) route. While clipping is a major surgical procedure, coiling is a minimally invasive technique and therefore appears more attractive. However, the choice of procedure depends on various other factors and needs to be decided carefully. Recent evidence suggests that coiling is highly effective and in certain conditions (eg posterior circulation aneurysms) much more favored option (13,17-20). A diagnosed or suspected case of aneurysm which warrants urgent or early intervention due to presentation (SAH or neurodeficts) should be refered to tertiary care center with facilities for endovascular treatment or neurosurgery. Performs Vascular Surgery When indicated or when IR procedures fail.